Towards an African Peace and Security Regime: Continental embeddedness, transnational linkages, strategic relevance provides an informed and critical reflection on the adequacy of the emerging African Peace and Security Architecture (APSA) to the medium- and long-term challenges and opportunities of conflict prevention, management and resolution in Africa. 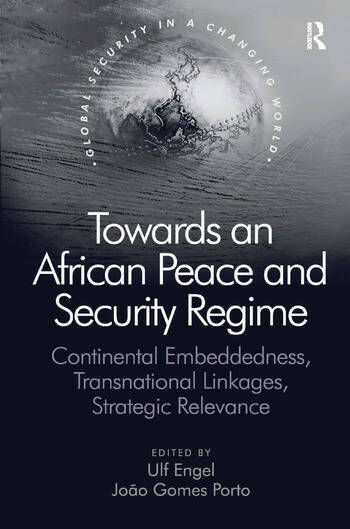 Complementary to the editors’ Africa’s New Peace and Security Architecture: Implementing norms, institutionalising solutions (Ashgate 2010), this volume revolves around three main areas of focus: the continental ’embeddedness’ of norms, values and processes required for the gradual coming into shape of the African peace and security regime; its transnational linkages as well as the wider collective security environment; and the empirical analysis of the connections between the continental level and the regional economic communities with case-studies on ECOWAS, SADC and COMESA. Contents: Introduction, JoÃ£o Gomes Porto; Part 1 Continental Embeddedness: The African Union and contested political order(s), Antonia Witt; From non-interference towards non-indifference: an ongoing paradigm shift within the African Union?, Martin Welz; The responsibility to protect by African organizations: a new trend in the cooperation between the UN and regional organizations, Rodrigo Tavares and TÃ¢nia FelÃ­cio. Part 2 Transnational Linkages: Africa’s regional economic communities and the multi-level logic of security cooperation on the continent, Benedikte Franke; Lessons learned and best practice from a troubled region: ECOWAS and the development of the ECOWAS standby force, Emma Birikorang; The weight of history: prospects and challenges for the Southern African Development Community, Anthoni van Nieuwkerk; COMWARN: COMESA’s distinctive contribution to the continental early warning system, JoÃ£o Gomes Porto. Part 3 Strategic Relevance: Positive, negative, or ambiguous? Peace-keeping in the local security fabric, Andreas Mehler; Regional security and intelligence cooperation in Africa: the potential contribution of the Committee on Intelligence and Security Services in Africa, Lauren Hutton; Capacity building for the African peace and security architecture: dos and don’ts in program design, Markus Koerner and Mulugeta Gebrehiwot; Challenges and opportunities for the AU’s peace and security council: a critical reflection from a regime analytical perspective, Kwesi Aning; Bibliography; Index.